The deer is also on the coat of arms of Berzehany. The wavy line symbolizes Zolota Lypa river which flows throuh Berezhany, and yellow and blue colours symbolize national colours of Ukraine. It is modern Berezhany flag. I scanned it from the Berezhany City Tour Booklet, published this year. "The emblem of the Austrian period looked like a per fess shield with gules and azure shield. 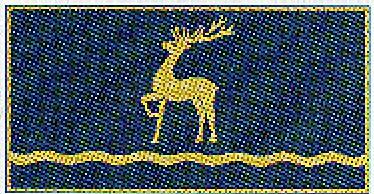 In the upper part there was an argent deer courant to the dexter side." "Berezhany's Coat of Arms - a forest deer on the blue background (it is a Austrian pre 1918 version of the town's coat of arms, the modern version is usually without the upper red part. Red and blue were the colours of flag of the Kingdom of Galicia, when it was part of Austrohungarian empire". "The first written mention refers to the XIV century. In 1350 it was given the Magdeburg Right." "Berezhany district has an area of 1100 sq. km and a population of about 100,000 (including Pidhaytsi district, which is now a separate administrative district unit). The district is agricultural with some light industry and factories in Berezhany. The town is situated on the both banks of the Zolota Lypa (Golden Lime Tree) River. The population of the town is about 20,000 persons.The town is surrounded by hills from all its sides (such as Zvirynets and Lysonya) According to Ukraine's last census, the number is 18,700. In 1900, Berezhany had 11,443 inhabitants (including 4395 Jews), and in 1939 the town had 12,700 inhabitants (including 4000 Jews). The distance between Ternopil and Berezhany is 52 km. There is a station on the Ternopil-Khodoriv railroad line in Berezhany. The area has been populated since the late paleolithic era. There are some signs of that period not far from the town. The first recorded, written evidence of Berezhany is from around 1375. Its territory was part of the Kievan Rus, Kingdom of Galicia, and later of the larger Rus Kingdom, Galicia, and Volhynnia. In the middle of the 14th century Galicia was conquered by the Polish king and was under Polish rule for a long time. In 1530 the king of Poland gave Berezhany to his vassel Synyavskiy, and the town adopted Magdeburg Law. From 1534 to 1554 Synyavskiy built the town fortress. Berezhany was part of the Polish kingdom until 1772, when, after the partition of Poland, it was incorporated into Austria, as the crown province of Galicia (Galizien). In 1867, as Austria became the dual monarchy Austria-Hungary, Galicia maintained its same status as an imperial crown province. After the collapse of Austro-Hungarian Empire, it was part of the short-lived Western-National Ukrainian Republic, which Polish troops quickly conquered after some resistance. It then became part of inter-war Poland until to 1939, when Berezhany (and all of western Ukraine) was occupied by the Soviet Union, becoming part of Ukrainian Soviet Socialist Republic which became independent in 1991. "